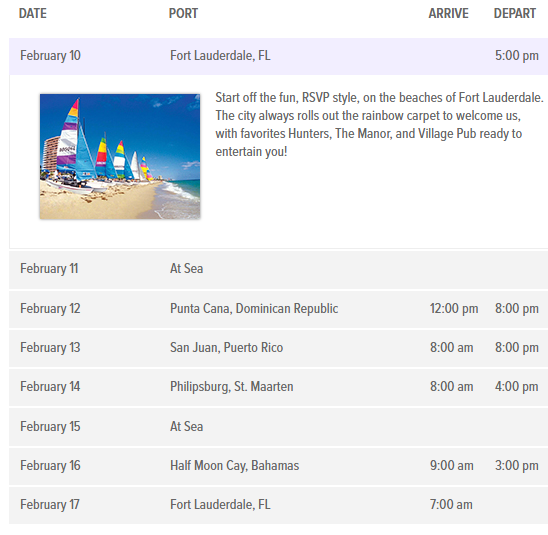 CARIBBEAN CRUISE ITINERARY | Islanders Travel Inc.
Embarkation begins around 11:30am on February 10, with all-aboard at 3:00pm. Disembarkation begins at approximately 7:30am on February 17. RSVP does not recommend flights from Ft. Lauderdale before 10:30am and from Miami before 11:30am. 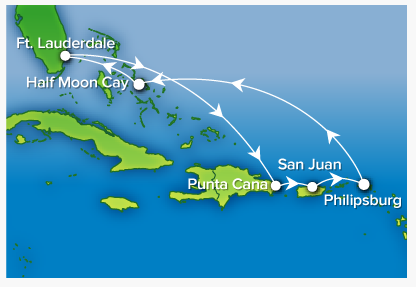 Our newest cruise sails to the most beautiful and exotic islands in the Caribbean, starting with our first-ever visit to the picture-perfect beaches of Punta Cana. Powder-white sand and endless shores meet azure waters to set the stage for an idyllic day. Vibrant San Juan invites you to explore the charming streets of Old Town or the sophisticated beaches in Condado, or discover the natural beauty just minutes from the city. If you’re in the mood to shop, the streets of Philipsburg on St. Maarten offer the best deals in the Caribbean. And the rest of the island boasts incredible tours, inviting beaches, world-class restaurants, and the distinctive flavor of both French and Dutch cultures on one majestic island. After a relaxing day at sea, we’ll arrive at our own private island of Half Moon Cay, your only decision is whether find a chair on the luxurious beach or join a few friends in the crystal blue waters. Add exceptional snorkeling and a few sports options for the perfect day in every way.